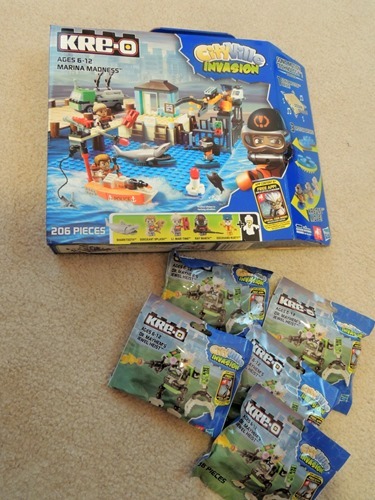 Last week, I received a box from bzzagent.com containing the KRE-O Cityville Invasion Marina Madness Building Set. 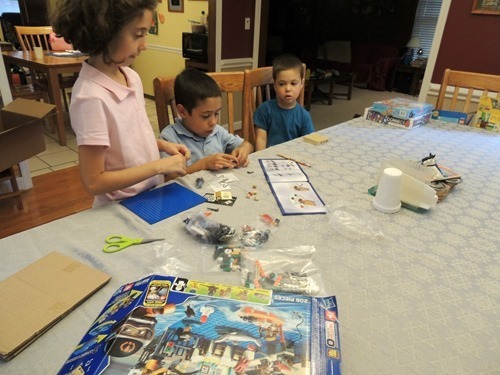 According to the manufacturer, the recommended age is 6 and up, the suggested retail price for the set is $19.99, and the set contains 206 pieces. “A shark is on the loose in the marina. Use the shark capture claw to save the day, and catch him before he catches you! Bzzagent also sent me 5 Dr. Mayhem’s Jewel Heist kits – 4 of which I plan to share! 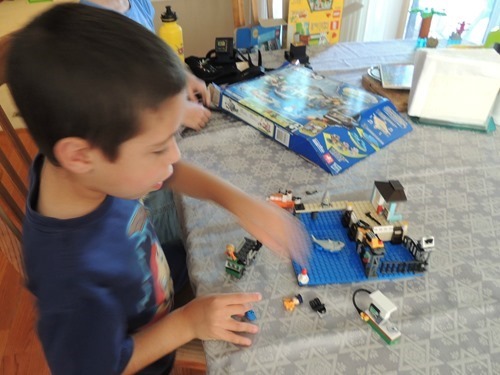 Sound waves trigger specific movements in the KRE-O motion bricks. Watch as the cities shuffle, swim, crash and roar to life! Zachary got to work at putting together the set. Zachary is just 6 years old. He can follow the directions and put together Lego sets. These directions are similar to the ones he has experienced. He had just a bit of trouble locating the pieces he needed and a few times he asked for my help. It took him longer to put this set together than his Legos normally take him. We found that some of the pieces did not want to stay attached. It was not so much that Zachary was frustrated though. He has been playing with the set since he finished putting it together. His favorite part is the motion brick. 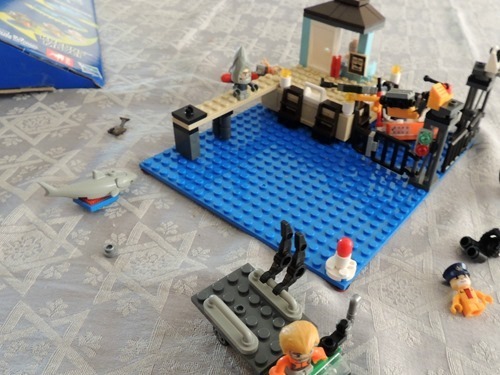 When the vibrations are adjusted, the shark and other pieces move around on the blue surface brick. Although the vibration is a bit loud, the kids have enjoyed this feature. 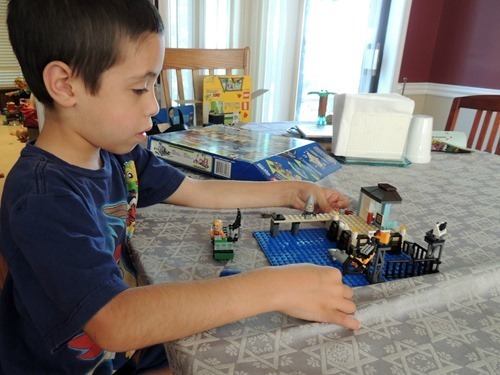 The motion brick also creates sound effects, which is also entertaining for the kids. Each Cityville Invasion kit comes with a code to access content on the Cityville Invasion app. We put the app on the iPad and tried to check it out. I personally was frustrated by the app because I could not enter my code for extra content without being forced to complete multiple levels of the game first. As we were trying to get to the point where we would be allowed to scan the code, Dave and I decided that the app was too violent for Zachary, as its main point was to shoot the bad guys. Zachary is only 6 and the app is recommended for ages 11 and up. While the set is recommended for those younger than 11, it is disappointing that the app is not appropriate for the same ages. Overall, the set has a lot of play potential with the ability to interact and create a story through play. 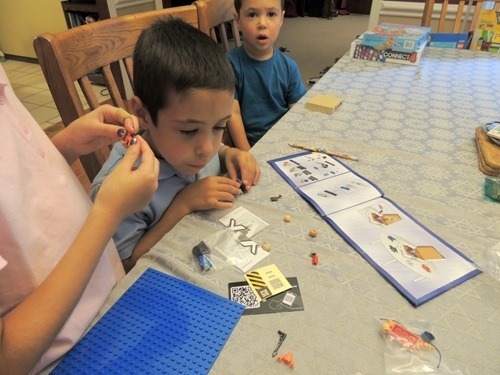 Fine motor skills are definitely engaged in putting together the pieces – and like other similar toys, putting them together is a big part of the fun. The sound and motion effects make the set different from other toys, and the price points start out much lower. The cons of the toy are the fact that some of the pieces don’t stay together easily and the volume of the motion effect, plus the violence in the related app. Overall, I would consider this a good toy for those with good fine motor skills and a little imagination! 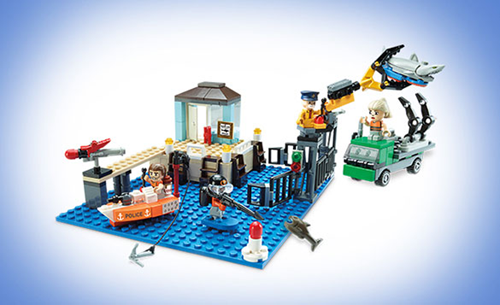 The KRE-O CityVille Invasion Marina Madness Set is available at Amazon. I received this item free to review. No other compensation was provided and all opinions and thoughts are my own.